CC For Sale: 1988 Buick LeSabre T-Type – Can You Go Home Again? 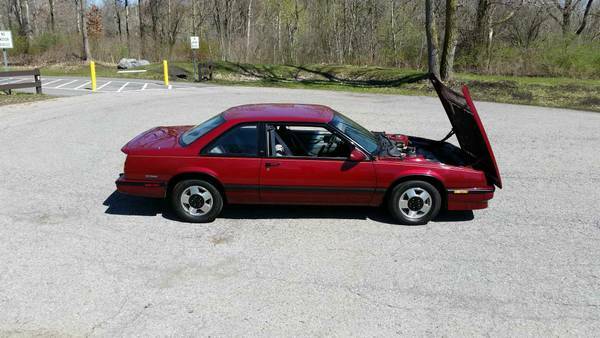 When I found this LeSabre T-Type on Craigslist, I thought two things. Firstly, this was a surprisingly attractive design for an American GM product from the 1980s. Secondly, didn’t our Jim Klein own one of these? If you’ll recall from his Cars Of A Lifetime series, the LeSabre T-Type replaced a VW GTI as Jim’s car. A big Buick was an odd choice for a young man back then even in sporty T-Type trim. The magic of the Grand National wasn’t enough to counter the conservative image of most of the Buick lineup. And the brand’s image would only become less and less palatable to younger buyers as the 80s wore on. 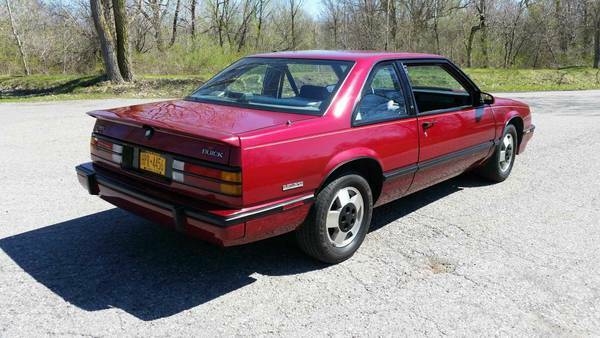 By the 1990s, the sporty T-Type Buicks were gone and the liveliest thing in the stable was a Skylark GS, hardly what young people were clamoring for. The Ford Taurus made a lot of similarly-sized GM vehicles look instantly dated but the LeSabre came out looking better than most, including its own Oldsmobile Delta 88 stablemate. 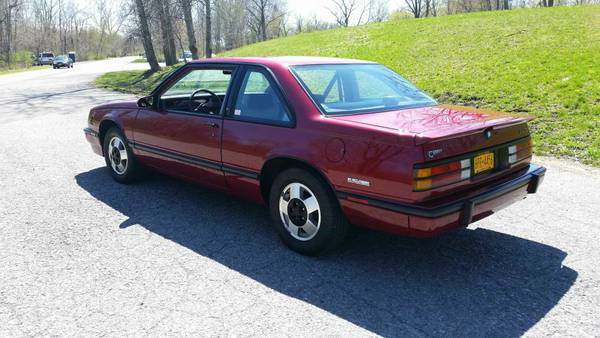 There were just enough curves and, remarkably for a 1980s GM product, the LeSabre coupe didn’t have a C-pillar you could straighten a painting against. The T-Type’s various cosmetic enhancements transform the already handsome LeSabre, making this one of the meanest-looking Buicks of the 1980s. Gotta love that clamshell hood, too. The T-Type package was first introduced in 1987. Unlike other Buick T-Types like the Electra, it was only available on the coupe variant of the LeSabre. For just under $2000, the package included 15-inch aluminum wheels and Eagle GT tires, Gran Touring suspension, 2.97:1 axle ratio, leather-wrapped steering wheel and shifter, red and amber taillights and blackout trim. The T-Type was available only in red, black, white and silver, and only with a black/gray interior with bucket seats and a console-mounted shifter for the mandatory four-speed automatic. There were also various cosmetic tweaks including a front air dam and a rear spoiler but the T-Type used the same 3.8 V6 as the regular LeSabre, good for 150 hp and 200 ft-lbs (165 hp and 210 ft-lbs from 1988). After 1989, the T-Type was gone. Buick produced 4,123 in 1987, 6,426 in 1988 and an unknown number in 1989. The LeSabre coupe soon followed the T-Type to the automotive graveyard. A LeSabre T-Type isn’t the fastest or most valuable GM vehicle from the 1980s but it’s distinctive, comfortable, reliable and fairly economical. The most glowing endorsement comes from Jim Klein himself. He seemed to really enjoy his T-Type, praising its throttle response and its buttoned-down suspension. Well Jim, this one’s for sale if you want to take a trip down Memory Lane. These were good-looking cars back in the day, particularly in black or red.One important thing that the T-type got was a full six-gauge dashboard, including a 100 mph speedometer – not commonly seen in other 1980s GM biggies. I need to know: Did the LeSabre T-Type have red dash lighting? I seem to recall reading in the brochures that some late-’80s Buicks with the T package included red gauge lighting (not the orangey-red used by Pontiac) but I haven’t seen one at night. 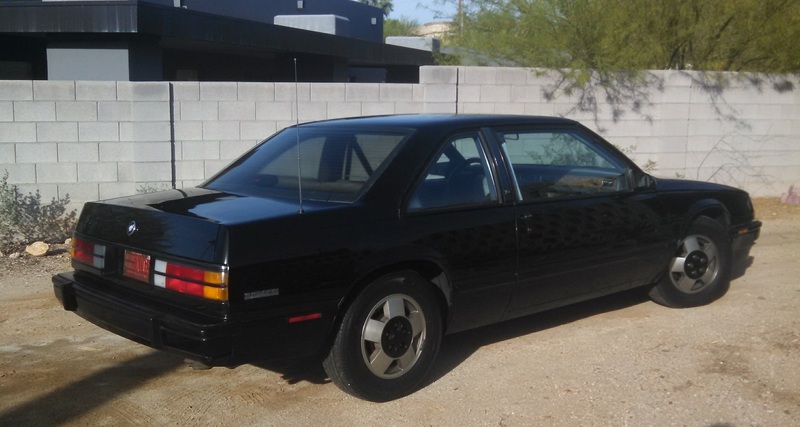 There was a LeSabre Grand National too, which had thin vertical side windows and blackout paint that made it look alot like the far more famous Regal version. But no additional power from other LeSabres so it was mainly an appearance package, and one that didn’t sell well. The next generation of LeSabre looked nothing at all like this car. The LeSabre Grand National came first as I recall. The T-type was adapted from that. Sorry, I do not recall the color of the instruments on mine. Red sounds correct but I’m not 100% on that anymore. No, it did not have red dash lighting. My coworker owned two Lesabre Ts and I owned two Electra T-Types (one runner and one parts car, each). Mine had red lighting in the dash. No doubt. In 1988, GM Brass [per Automotive News at time] ordered Buick and Olds to “switch roles”. Buick would be ‘traditional’ and Olds would be ‘import fighter’. So, no more Buick T Types and GN’s. Olds got the Quad 4 and Acheiva, Aurora, etc. The fact there was no 4-door LeSabre T-Type already made it “traditional” in the ’80s context. There was a 4-door T-Type – it was an Electra. I owned one for 16 years. amazingly these Buicks and contemporary Impalas are the longest lasting GM cars of this era. These were one of GM’s better efforts in the ’80s. A nice looking car. Shame about those wretched door-mounted seatbelts, though, which I detest. I found these the most attractive of anything GM ever built on the H/G platform. Always thought these were a sad follow-up to the 1983-1986 G-Body Regal T-Type. They’re not bad cars in and of themselves but I think they fell way short of the mark left by the RWD turbo Buicks of the mid ’80s, and therefore were easily forgotten. FWD I could tolerate, but I was very deflated when I learned these weren’t turbocharged, I found them a lot more attractive than the G-body Regal when I was younger. Before the internet I had assumed for a long time the Lesabre T type replaced the Grand Nationals, as they were so uncommon and information about them in the 90s was that nonexistent. T-type has to be the most misleading trim line ever. What the hell is the T supposed to stand for on NA powered engines? “Trim type”? I honestly thought until now that any Buick T-Type was turbocharged, up to and including the current Opel Insignia based model. That’s disappointing to say the least; part of GM’s brand dilution in the ’80s from which they’ve never fully recovered. Can anyone explain why, in the darkest days of GM’s platform-sharing, the Buicks got their own clamshell hood? That was Buick being ‘import fighter’ before the switch with Olds. When the FWD C body ’85 Electra came out, Buick had ads in Car & Driver, with blacked out T Type, claiming “Euro Inspired”, etc. Because Buick engineers got their way. And let me tell you, having owned my 1988 Electra T-Type for 16 years and doing all of my own work on it, that hood design was awesome, as it allowed unimpeded access to the sides and rear of the engine. The only thing to watch out for was running the engine for an excessive period (say, while you are doing an A/C recharge) with the hood open – with the hood in the vertical position, it blocked most of the airflow through the radiator which could cause it to overheat. This generation of car had so many good ideas (that gradually got value-engineered out), such as headlight assemblies that were removable from the front of the car using zero tools. You simply removed two large thumbscrews from the top, and the whole headlamp assembly could be lifted out of its place, exposing the bulb sockets in the rear. And another good idea: both the low and high-beam headlamp bulbs used the same dual-filament bulb. So assuming that you hadn’t done this already, if you lost a low-beam bulb, you could pop the hood, remove the headlamp assembly, and swap low and high beam bulbs, all without tools and in a matter of 5 minutes, on the side of the road. Compare and contrast to many modern-day cars where you have to remove the bumper fascia in order to remove the headlamp assemblies in order to change a stupid headlight bulb, taking well over an hour and requiring a dozen or two fasteners to be touched. Is this progress? I generally take a dim view of Consumer Reports’ self-righteous preaching, but I have to agree with them on this count; they said that front-hinged hood idea worked well on “certain imports” (i.e., Hondas and Saabs) but was clumsily engineered and a real nuisance as done by GM. Probably not a dealbreaker; one could reasonably wish not to have to open the hood very often (whether that wish is granted is a separate question). But those stupendously stupid, horrendously dangerous door-mounted seatbelts are an absolute, flat no thanks; I’d rather live. I never understood the real safety rationale behind that kind of belts. From what you say, I guess there was no safety involved. Leaving aside, of course, the costs involved in providing an airbag at the time. GM was trying to avoid adding air bags. There were still some ‘GM lifers’ who wanted to promote passive seat belts as “better”. Motor Trend in the 70’s was against air bags, and made fun of them. Now I’m curious, what was Motor Trend’s argument against airbags? Same “argument” they used against every other piece of safety and emissions-control regulation and technology: Blah blah bureaucrats legislating themselves into engineers, blahbitty blah Washington telling the world’s automakers how to do their jobs, blah blah don’t personally want any of this stuff but being forced to pay for it, blah blahbitty blah. Nothing more than an infantile temper tantrum, but it was red meat for their readership. Road & Track was also hugely anti-airbag in the very early years, perhaps before they were offered on any car. The hypothesis (and instruction in at least the book to my ’89 Bonneville) was that you’d leave the seat belt bucked all the time, and you’d enter and exit without concern of whether or not you’d buckled up. In practice, it was unpleasantly difficult to do, which meant using the seatbelt in the traditional manner, but with the lessened safety of having it affixed to the door. Oh, and the buckle would eventually wear out, too. It wasn’t just GM that had a hard time adapting to airbags as a means of passive restraint. Who could forget Ford’s infamous ‘mouse belts’, so-called because it was if a mouse was running along the A-pillar as the motorized belt moved backwards to cinch down the driver/passenger automatically. Unfortunately, sometimes those mice got a little too enthusiast and would squeeze the shoulder belt down uncomfortably on the occupant(s). This is one area where Iacocca, rather then employing all these Rube Goldberg machinations, simply bit the bullet and put airbags in Chrysler’s cars from the start. Not quite – Chrysler used a driver-side airbag and passenger-side mouse belt on some K derivatives, including the last of the Acclaim/Spirit twins. We have Volkswagen and General Motors to thank for the door-mounted seat belts as well as motorised shoulder seat belts. Of course, US Department of Transportation is one of the guilty parties for wording the mandate. Volkswagen introduced the automatic seat belts in its first experimental safety vehicle (ESVW I) in 1972. The concept is similar to the most reviled motorised shoulder seat belts. In 1975, Volkswagen fitted the door-mounted shoulder seat belts and knee pads to Rabbit Mk1 for the US market. See the advertisement below. General Motors, as many of you are quite familiar, offered the air bags as an extra-cost option in selected models in 1975. However, they didn’t exactly fly off the shelf so to speak due to their staggering cost ($900 in 1975, or about $4,300 adjusted). DOT mandated that the passive restraint system be fitted to the vehicles for the 1983 model year. Here’s the problem: the manufacturers could choose either airbags or automatic seat belts as passive restraint system. The legal squabble over the mandate delayed the deployment to 1987. General Motors and other manufacturers took a page from the history and hoped to repeat the scenario: seat belt interlocking device. It was hoped that the worst of door-mounted seat belts and motorised shoulder seat belt would persuade the consumers to revolt against the passive restraint system. You’re assuming there was a safety-based rationale! VW loosed door-mount shoulder straps on the world (or maybe just on the States) in 1975, and that same setup was on my folks’ ’90 Jetta. Big damnuisance to get in and out of the car, and very unsafe for a variety of unpleasant reasons: people forgot to fasten the separate lap belt, which meant they submarined under the shoulder strap and into the steering wheel/dashboard. Guess they weren’t really planning on using their knees any more, anyhow. The GM door-mount belts were even worse (anyone surprised?). The entire unitised lap and shoulder belt was mounted in the door. The door, as a movable component, is very much weaker than fixed parts of the car structure where seatbelts are usually anchored—such as, y’know, like, the floor and the B-pillar. Also, the door is much more likely than those traditional mount points to be struck in a crash, and the door, as a movable component, is…movable! Right then and there in a crash, right when you really need the belt, now its mount points are moving. And does a belt reel work properly while it’s in the middle of being powerfully crushed? Who the hell knows? (probably freakin’ not). The door-mount GM belts were newly on the scene when I was in high school, where I did an investigative project on them for a college-prep writing class. Combed through the newspapers as best I could in those pre-internet days. Found some really good quotes, including a GM rep saying car doors don’t open in crashes and a NHTSA rep excusing his agency’s OK of door-mounted belts by saying “We were willing to degrade the protection, possibly degrade the protection offered by the belts, in order to get more people to buckle up”. 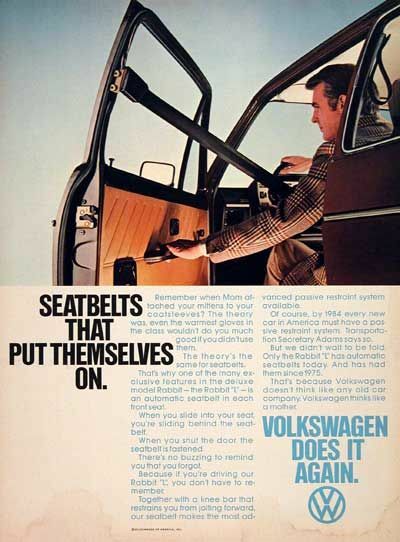 At the time I thought (and I still think) this a lame excuse for the halfassed VW belts, and a nonsequitur in re the GM door-mounted belts, which were still fully manual. That’s an important point to emphasize: those GM door-mount belts were still fully manual. They were not an airbag-avoidance tactic, or a thing put forth by GM as an alternative to airbags. That dishonour belongs to various “passive” belts, including VW’s dumb shoulder straps attached to the door and a variety of makers’ electrically-operated shoulder belts (slightly less nuisance but same problem, still abjectly dangerous when the separate lap belt wasn’t fastened, which it often wasn’t). So why did GM go forth with the door-mounted seatbelts, then? I don’t know for absolute certain, but I have a sturdy guess backed up by many years of GM (mal)practice: it was cheaper that way. Another thing that I’ve come across is the latches or buckles that General Motors and other American manufacturers used for many years: RCF-67/Type I buckles. Many engineers and law firms have gone after those types as skimping on passenger safety. They were too easy to unlatch without touching the release buttons as I discovered when owning 1982 Buick Skylark and 1986 Chevrolet Celebrity. 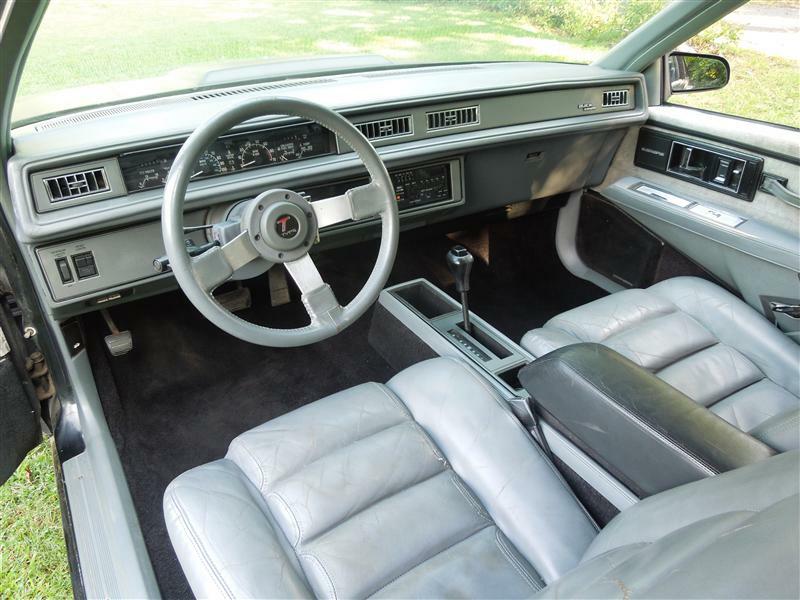 The GM vehicles exported to Europe in the late 1970s and 1980s had different seat belts. Oooowow. It looks like you’re right about those RCF-67 buckles. That wouldn’t be the only time American-market cars got lousy seatbelts. Chrysler put bad ones on a whole lot of North American-market cars starting in ’93 or ’94. And then there’s the ugly fact that North American regs didn’t require rear shoulder belts until some ridiculous number of years after European regulations began requiring them. My first car, a 1971 Alfa Romeo 1750A Berlina, had the front-hinged hood. It’s colossal pain in the arse given the high maintenance nature of macchina italiana. We’d taken the hood off a few times just to service the engine bay better. Had an 86 Riviera and an 86 LeSabre. Not a single issue with the hoods on either one. Also the much maligned GCC on the Riviera was flawless. Oh, you’re killing me here, Will! It was a great car and I must have been the youngest owner of one in California at the time (mid-90’s). The fact that I found it at a Cadillac dealer and that I was even AT a Cadillac dealer is astounding too. It was a very good car and while the power does not sound like a lot nowadays, it was quite enough for it. Lack thereof was not an issue. As I mentioned in my COAL, the interior, specifically the dashboard was its biggest let-down. While functional I simply didn’t find it attractive at all. The clamshell hood was fine, good even. No worse and possibly better than Saab or BMW used. MAYBE the criticism comes from it being a rather large stamping and thus you always knew it was something to be little cautious with but it’s a 3800, the hood doesn’t need to come up very often anyway. The styling would have been less attractive with the added cutlines and locations of them if it were a “standard” hood. Oh, I could be mistaken but I believe the rear spoiler (more of a decklid extension really) wasn’t on ’87’s but became standard for ’88. The hood bulge on this one is the first one I’ve seen like it and I believe it is purely cosmetic, I don’t think there is an opening inside this hood. That’d be my only concern but otherwise based on what’s visible in the ad, $4500 doesn’t seem like a bad price for a well taken care of, very distinctive, and roomy two door coupe that’s out of the ordinary. Yeah, that photo of the instrument cluster in an earlier comment is rather off-putting. 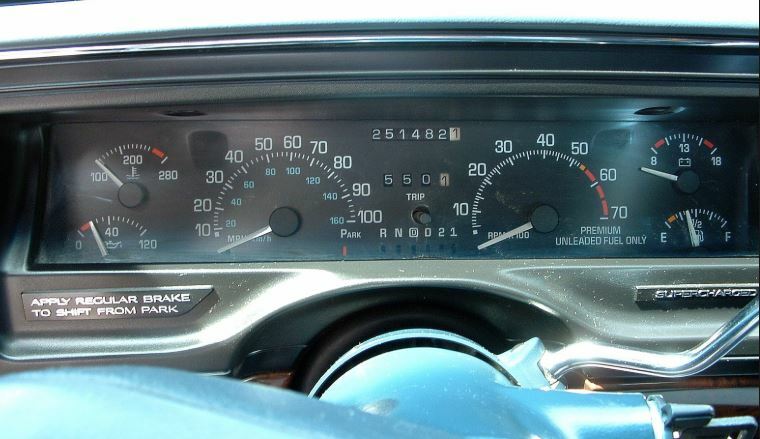 It looks way too much like a Lumina and it’s all-too-obvious that the dashboard was designed to house a traditional scale-and-pointer strip speedometer where they just jammed in some smallish round gauges. OTOH, I rather like that flat rear spoiler. It seems to me that Buick eschewed the purely cosmetic spoiler for one that’s actually functional. Not so much for any kind of aerodynamic benefit, but I can see that flat-style spoiler going a long way to keeping dirt and grime off of the taillights, not to mention aiding visibility in bright sunlight. The 1992+ LeSabre dash had more room for instruments, but unfortunately there was no more T-type. These were terrific cars. But everything that made them good had to do with the name LeSabre, not T-Type. As Buick quickly found out, a 4 door Limited was the hot seller of the group. I wonder how many children/grandchildren are still rocking these cars today, many decades after they were purchased by the original owner? droooool. I wanted one then, I want one now. Although I didn’t personally care for all that easily flaking off black paint trim; the rest of the “T-Type” package made this full sized car one dayum fine “Driver’s Car”. “Real World Quick” (for the time period) engine, smooth unobtrusive shifting transmission, roomy, spacious interior, useable back seat, large trunk, GM’s usual excellent #HVAC system……what’s NOT to like here! These big Buicks were pretty cars, sedans and coupes alike. We had a bunch of 4 door base model LeSabres at the funeral homes where I worked, used them to lead processions. I seem to recall that the rear license plate wasn’t bolted in, it just slid down into a “mail slot” between the taillamps and was impossible to remove without opening the trunk first. I am reasonably sure I’ve never seen a T-Type in the flesh. One of the funeral directors had an Olds 88 coupe of similar vintage, beige with tan cloth, whitewalls and wire wheels. Pretty car too. A better idea from Buick. That was also used on the final Rivieras. I had one (also 3800) and I appreciated the clever design. Smart security. One of GM’s better efforts of the 80’s; if only they had seen fit to equip it with a supercharger like some of the later 3800 models had the benefit of. Quite a looker in any case! I do wonder if the hood bulge is original? The T-type trim line should have been THE Buick line. Instead it got positioned as premium with regular Buick’s equipped with convex wire wheel covers, chintzy chrome at every seam, puffy vinyl tops and a 1975 color palate. Buick was torn in two due to GM’s indecisive commitment to the past or the future, and because they let the aging complacent buyer base vote with their wallets on the brougham trims, the T-type trim lost, and they gave up any hope of the Buick’s future in America after they age out. I have always thought GM had no shortage of good and appealing cars through the Roger Smith era, but that indecision created gigantic confusing arrays of models and trims that buried cars like this quite appealing LeSabre T-Type into obscurity. There was another gasp in the 90’s with the GS Regals with Superchargers. The supercharged Park Avenue was interesting too in a (very) dark horse sort of way. No athleticism on the Park but excellent engine and great build quality. 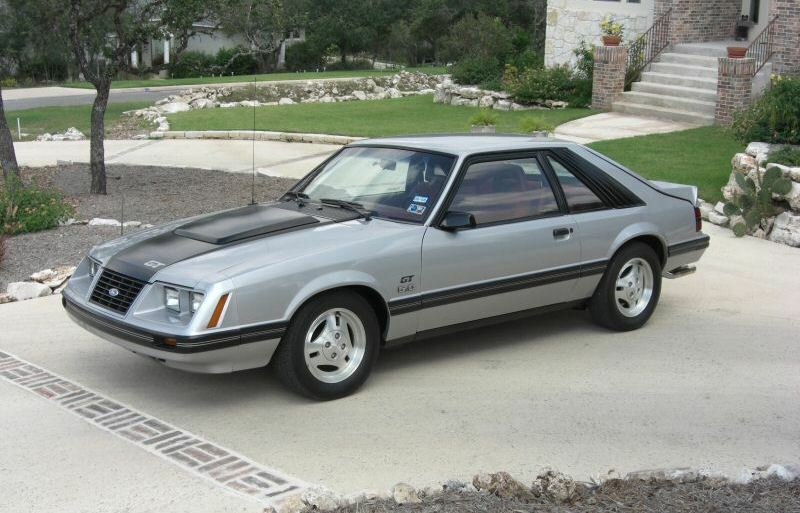 I agree with XR7Matt on the Mustang hood scoop. The Mustang fake hood-scoop is lame, even though it was done well and matches. Can’t say that I much liked them on Mustangs, either. Too bad because, otherwise, it’s a nice car, a rarity during the Roger Smith GM era. I have always liked the Lesabre T-Type. It was an attractive car. 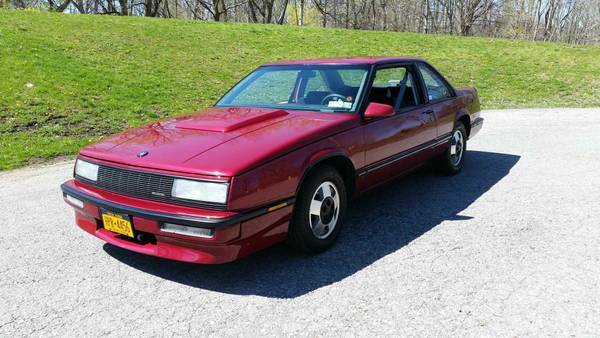 The 86-90 Lesabre and Olds 88 coupes were attractive and looked a lot better then the B Body coupes which looked as if they cut off the back 2 doors. I love, love, love this car and if it was available nearby I might be getting into some pretty bad arguments with my wife why we need it. I think it was Paul and he really had a point. These are just so… respectable. Conservative without being retrograde, just a tad premium without being gaudy. Subsequent LeSabres went a bit too far with the “Premium American Motorcar” schtick, having a bit too much chrome and looking a bit too geriatric for my tastes. I was running errands in central Florida yesterday when I was passed by a late model Regal T-Type in this shade of red or one very close. Not a bad looking car, for a 4 door sedan. Apparently, once again Buick revived the T-Type name for a short period before replacing it with the GS nameplate. I have seen about 2 or 3 of these LeSabre T-Type cars over the years, all here in Florida and 1 LeSabre Grand National. The GN struck me as looking like one of those dealer installed packages that attempts to make a rather plain/unpopular car look special/distinctive. I remember being shocked when I first saw this series LeSabre. A customer at work had one. I thought it was gorgeous, perhaps the prettiest big Buick since the original Riviera. It has aged well, and continues to be one of my favorites. I admired these cars, and I really thought Buick was headed in the right direction with the Grand National and the T-types. Had I had the money in those years, I would have seriously considered one. I thought they were a good move toward a modern niche for Buick of fast luxury with quality (although I did think that Olds would have better for the role). We’d owned an 86 and an 88 Acura Integra and Buick was on my radar in 1990, as I finally thought I could afford to go up a class but suddenly the T-Types were over, and it was back to the same old GM. Trying to move the halo over to Oldsmobile and pretending that Buick had never had its wild years just confused everybody and destroyed any momentum. Have an 87, yes the rear spoiler was not available until near the end of the 87 model run. They are fine handling and seriously dependable cars. Mine is not a DD. and grabbed first place in her division 1980 to 2018, in a recent BOP-C show here in Scottsdale, against other fine Buicks, including some very nice Rivieras. They are rare, which may have helped. as Mine is the only one I have seen on the road in the entire Phoenix area In the 4 years I have owned it. 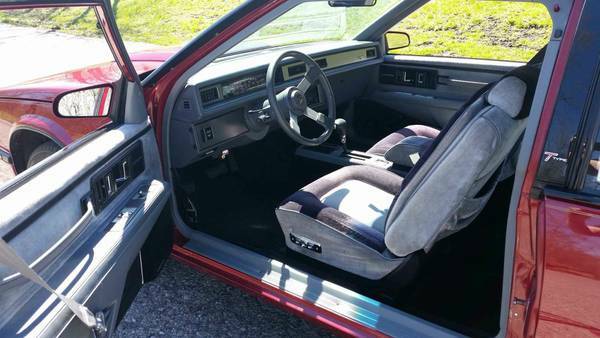 87 was also the only year with the dull GN black and gray interior including both colors on all four of the bucket styled seats. Folks love the Clamshell hood and the drop in License plate design, when at a show. She gets a lot of thumbs up and knowing smiles in traffic. when she is in traffic. Great looking car! The subject car looks nice, and the seller thoughtfully (proudly?) included a bunch of undercarriage shots. For a Buffalo car, it is probably considered rust free. By Arizona standards, though, it’s a rustbucket. If yours is from the southwest, it’s probably nicer, assuming there isn’t sun damage. Jason, you car is just like one I bought new in 1987. If you would ever consider selling it, please drop me an E-mail at scottfettner@hotmail.com Thanks!